This image shows the MER Spirit rover at its location on the north edge of Home Plate in the Columbia Hills, and was taken on the southern hemisphere winter solstice at about 2 p.m. local time on Spirit's 1,591st sol on Mars. 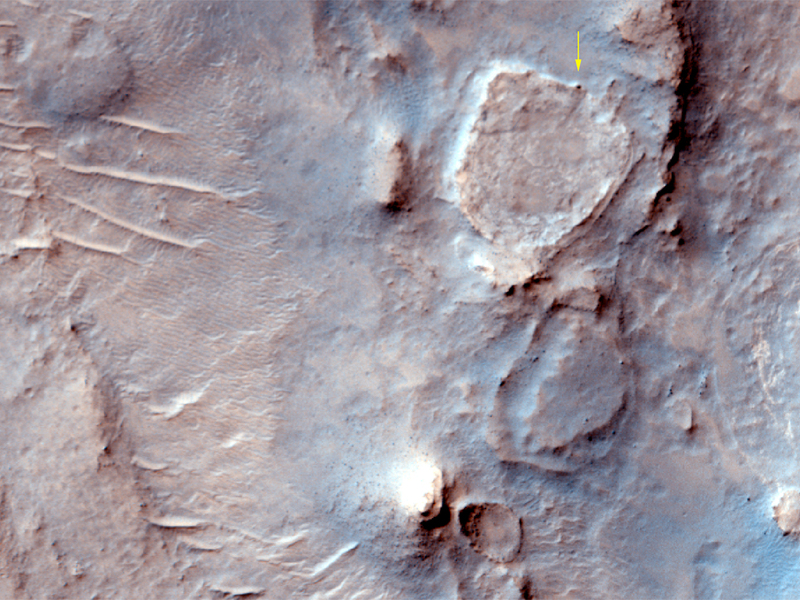 Home Plate is the elevated round and light toned mesa on the right side of the image. Spirit is visible at the large dark "bump"� on the north-northeast edge of Home Plate. The image was acquired at mid-winter because that is the time of the clearest and least dusty atmosphere. The optical clarity of the sky is measured as a value called "tau" and can range from 0.15 in winter to 6.0 (or higher) like that seen last summer. Spirit measured a "tau" of 0.19 the day before this image was acquired; the clarity of the sky was about as good as it gets. Another factor in making this image special is the low-angle lighting of mid-winter, which results in slightly longer shadows. Long shadows aid in detecting small features like rocks, outcrops, and low ridges and scarps. The bowl-like upturned edges of Home Plate are emphasized by this low-angle lighting. Just east of Home Plate is a ridge, informally named Mitcheltree Ridge. During its field season last Martian summer, Spirit discovered unusual high silica deposits between the ridge and Home Plate. These deposits are comparable in many ways to high-silica spring deposits of Earth. 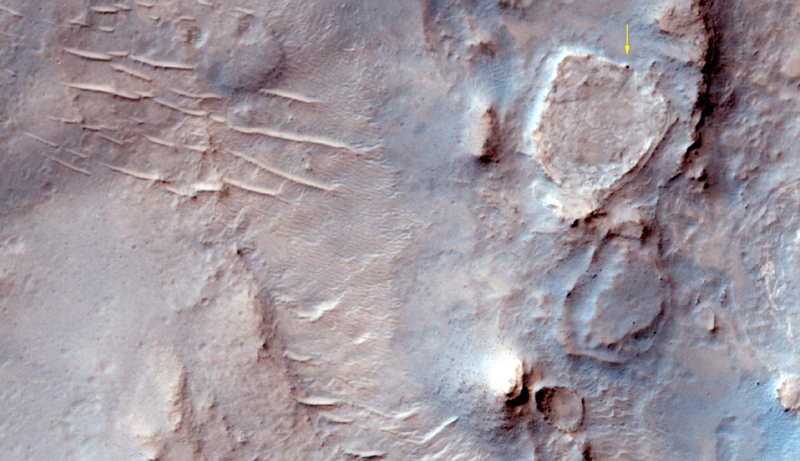 To the south of Home Plate's roughly circular area nearly the same size, is another mesa informally named Crossfield. Just to the Southwest of that are two unusual features, a butte and a crater (informally named Von Braun and Goddard, respectively). Another purpose of this image is to aid in selecting a traverse in the coming field season. Spirit will leave Home Plate, drive west and south around the north edge, south along the bottom of the valley between Home Plate and the long ridge to the west informally named Tsiolkovski, and then southward towards the butte and crater farther south.